Pdfsharp is a popular open source framework which could be used to create PDF files programmatically. In many situations we need PDF documents instead of text documents because text files are listed as the simplest file format, which limits users only to edit words. From the following steps you can easily convert a text file to a PDF formated document. 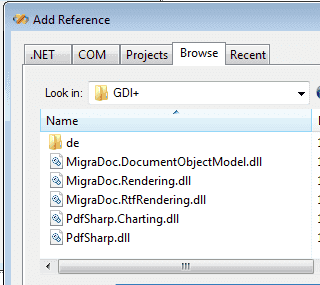 After download the zip file, extract it and add the reference to your c# project. 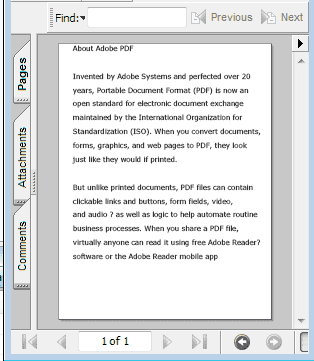 Steps to create PDF file programmatically. First you need a Text Reader Object to read the text from Text file. Next step is to create a PDF Object and a Page Object. Now your PDF Object is ready to write the contents, so the next step is to read the content from the Text file and write to the PDF . In the above code we set X as 40 pixels from the left side and Y as a variable "yPoint", because after write the each line, yPoint will increase 40 pixels line spce then only you get a resonable space between lines. After read all the line from Txt file, you can save the PDF file with your desired name with .pdf extension. Then close the Reader Object. The following program shows how to generate a PDF file from Text file content.